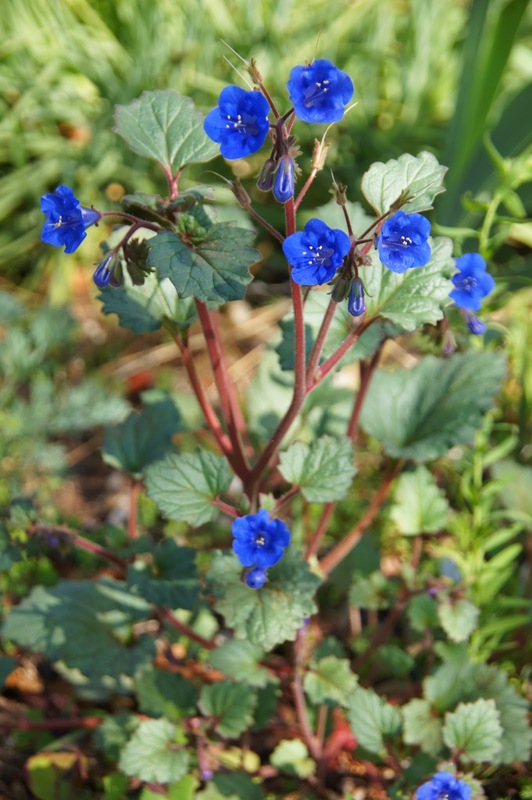 Phacelia campanularia, aka Desert Bluebells, a California native wildflower, grows readily from seed, glows blue and burgundy, and seeds itself in new and interesting places year after year. Seeds are often available on your closest rocky hillside in the late spring. Or, do like I did. Receive the seeds as a gift from your very-talented-gardener-mother (or father or aunt or friend, whatever your equivalent). Tuck the envelope into your backpack for safekeeping on the trip home. Promptly forget the seeds are there. Continue to forget for a couple years, then find them one day, releasing a weird squeal-groan combo that simultaneously expresses delight at finding what was lost and guilt for losing it in the first place. Plant the seeds that fall. The following spring, collect seeds from the plants that resented your forgetfulness the least, and toss them around the yard. Then, wait for this year's show of plants that have fully forgiven. When people complain about oxalis invading lawns, usually they're whining about Oxalis corniculata, Creeping Woodsorrel, a vigorously crawling, low growing plant covered with tiny yellow flowers that eventually turn into explosive seed pods, scattering more creepers every direction. 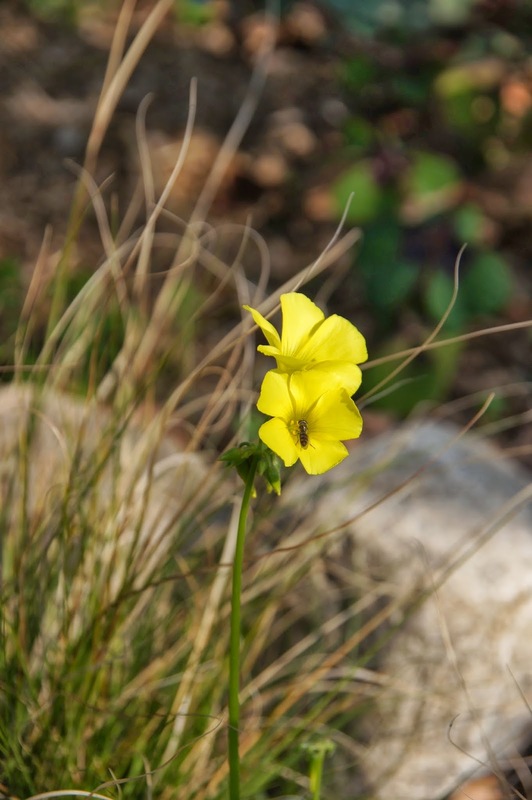 Others complain about the South African weed that covers California hillsides in the late winter—Oxalis pes-caprae, Cape Sorrel or Goat's Foot—a lush-looking plant with green, heart-shaped leaves spattered purple, and quarter-sized satin-y yellow flowers. The long roots attach to small bulbs deep underground that are hard to find. Pulling them out never seems to pull the bulb out. Both these species of oxalis are edible in small quantities, and their leaves and flowers add a pleasant lemony flavor to salads or garnishes. I understand the dismay over the Creeping Woodsorrel, as it is never beautiful and grows so thickly it overtakes other plants. Yet, I have mixed feelings over Goat's Foot. It's so pretty. When it blankets a freeway bank or untended hillside this time of year, the whole area gleams deep green and gold. I pull lots of Goat's Foot, but some gets away from me every year, and right now, a small patch is blooming in the front meadow. I'll wait until it has finished its gorgeous bloom-season to pull it out, then kick myself later for waiting so long. While these two species give the genus a bad rap, there are many other species that are dreamy. Between stepping stones in a bed of bearded iris, Oxalis fabaefolia grows, nearly flat to the ground, spreading slowly and manageably. The leaves look just like rosettes of fava bean leaves, and the profuse fall-blooming flowers are half-dollar sized and the same, satiny yellow as Goat's Foot blossoms. In another part of the bed, Oxalis tetraphylla, var "Iron Cross" grows, with large four-leafed fans stained bloody in the center. Iron Cross never blooms much for me, but I'll never get over the thrill of finding four-leaf shamrocks in my own yard. Oxalis tetraphylla, var "Iron Cross"
Right now, the Oxalis purpurea, var "Garnet" is blooming. This is its second year and first bloom in my garden, and I'm happy to see the small patch is spreading underneath one of my apple trees. 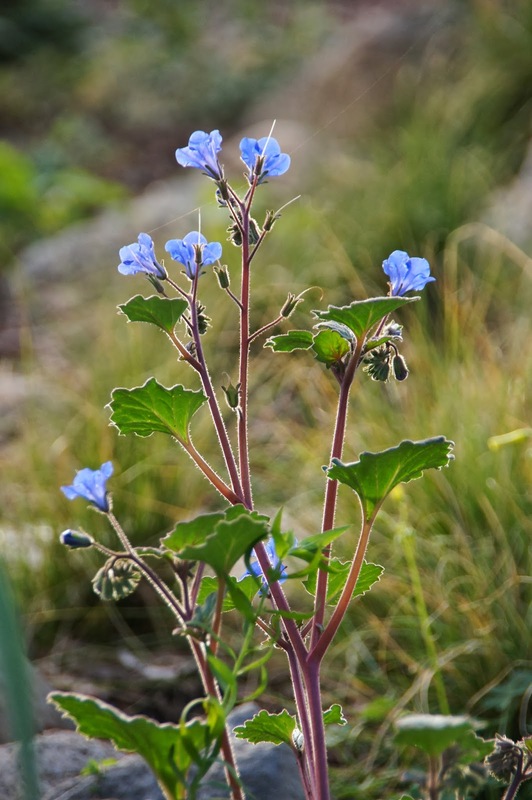 The plant is worth growing for its velvety purple, rounded leaves, but the 80's-lipstick-pink flowers and their twirling-skirt blooming habit make this species even sexier. The plants stay low to the ground, as you can see in this picture where it mingles with mâche, a salad green that has naturalized in my yard. 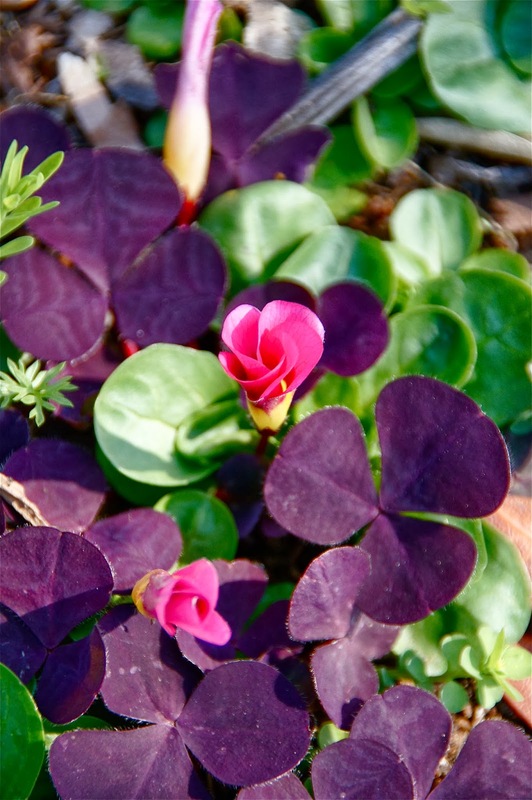 Oxalis species work well in my garden of alkaline, well-draining soil and mild winters. They receive very little care and not much water, but they make themselves right at home here. There are more species and varieties I lust after: pale-moon blossomed Oxalis luteola; with flowers like candycanes and leaves like palm trees, Oxalis versicolor; and any of the dramatically colored variations of Oxalis obtusa. What's the difference between the weed and the dream? Is a weed something that reminds us that we don't have control? Maybe this is the year I should give up the fight against Goat's Foot and simply enjoy it. Or, maybe not. Oxalis tests my own definitions and desires.